The aim of the study was to investigate the prevalence of interstitial lung diseases in patients with gastroesophageal reflux disease (GERD) and to show the correlation between them. Interstitial lung diseases are a common complication in patients with GERD because of repeated aspiration of gastric acid. One hundred patients with GERD (25 patients with GERD grade A, 25 patients with GERD grade B, 25 patients with GERD grade C, and 25 patients with GERD grade D) with no past history of pulmonary diseases, collagen vascular diseases, chronic liver diseases, or ascites were enrolled in this study. All patients were subjected to the following after obtaining their oral consent for participation: complete medical history, examination, laboratory investigations, upper gastrointestinal endoscopy, radiological investigation [plain chest radiography and chest high-resolution computed tomography (HRCT)], and pulmonary function tests [spirometry and diffusing lung capacity of carbon monoxide (DLCO)]. When the severity of GERD increased the mean percentage of DLCO decreased (patients with GERD grade D had the lowest DLCO (75.4 ± 26.8). There was a statistically significant negative correlation between the grades of GERD, DLCO, and forced vital capacity%. There was a highly statistically significant difference as regards grades of GERD in relation to chest HRCT results (P < 0.001) and a statistically significant positive correlation between chest HRCT and grades of GERD (when the grade of GERD increased, the degree of ILD patterns in chest HRCT increased). The present data support and extend the theory of a high incidence of pulmonary involvement in GERD patients even in those patients free of respiratory symptoms. Interstitial lung diseases (ILDs) form a heterogeneous group of nonmalignant, noninfectious processes of the lower respiratory tract that are characterized by alveolointerstitial inflammation and fibrosis on histological examination . Gastroesophageal reflux disease (GERD) has been associated with a number of ILDs, including idiopathic pulmonary fibrosis and systemic sclerosis . Abnormal gastroesophageal reflux occurs when there is failure of one or more of the physiological protective mechanisms . Emerging data support a role for chronic microaspiration (i.e., subclinical aspiration of small droplets) in the pathogenesis and natural history of ILDs. A written consent form approved by the Local Ethical Research Committee in Menoufia Faculty of Medicine was obtained from every individual before the study initiation. This prospective study was carried out in the Chest Department of Menoufia University Hospital between February 2015 and April 2016 on 100 patients [61 men (61%) and 39 women (39%)] diagnosed with GERD according to Los Angeles classification (grades A, B, C, and D) . They were selected from the Tropical Medicine Department of Menoufia University Hospital. Oral consent was taken from the patients. Pulmonary function tests using Quark PFT-DLco module 3 (Rome, Italy), which included spirometry]slow vital capacity, forced vital capacity (FVC), forced expiratory volume in the first second (FEV1), FEV1/FVC, forced expiratory flow 25–75%, maximal voluntary ventilation[ and diffusing lung capacity of carbon monoxide (DLCO). Data were collected, tabulated, and statistically analyzed using an IBM personal computer with the statistical package of social sciences, version 20 (SPSS Inc, Chicago, Illinois, USA). Descriptive statistics for quantitative data were presented in the form of mean, SD, and range, and qualitative data were presented as numbers and percentages. Analytical statistics were used to find the possible associations between the studied factors and the targeted disease. Spearman's correlation test: This test was performed to study the correlation between one qualitative variable and one quantitative variable or two quantitative variables of not normally distributed data. P values less than 0.05 were considered significant. P values more than 0.05 were considered statistically nonsignificant. P values less than 0.05 were considered statistically significant. P values less than 0.001 were considered statistically highly significant. Patients with normal DLCO comprised 36 men and 33 women, of a mean age of 49.0 ± 8.00 years. Patients with mildly decreased DLCO were two men and two women, of a mean age of 34.0 ± 7.78 years. Patients with moderately decreased DLCO were 16 men and four women, of a mean age of 49.2 ± 7.45 years. Patients with severely decreased DLCO consisted of seven men, of a mean age of 51.6 ± 4.27 years [Figure 1]. 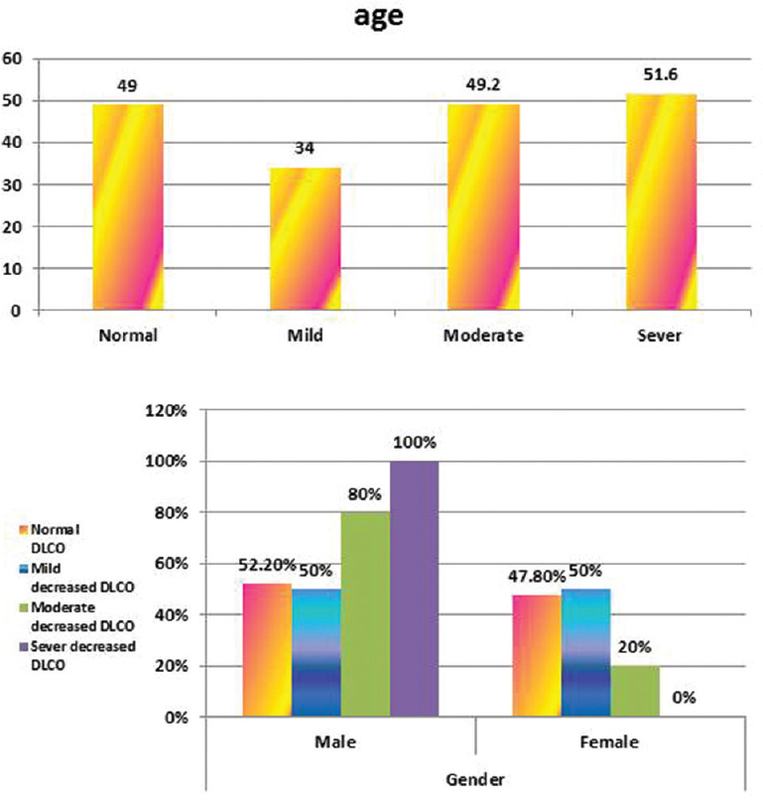 Figure 1: Demographic data among the studied patients in relation to DLCO. DLCO, diffusing lung capacity of carbon monoxide. When the severity of GERD increased, the mean percentage of DLCO decreased [patients with GERD grade D had the lowest DLCO (mean 75.4 ± 26.8)] [Table 1]. There was a highly statistically significant difference between upper gastrointestinal endoscopy results and DLCO results (moderately and severely decreased DLCO was significantly high in patients with GERD grades C and D) [Table 2]. There was a statistically significant negative correlation between grades of GERD and DLCO among the studied patients [Figure 2]. 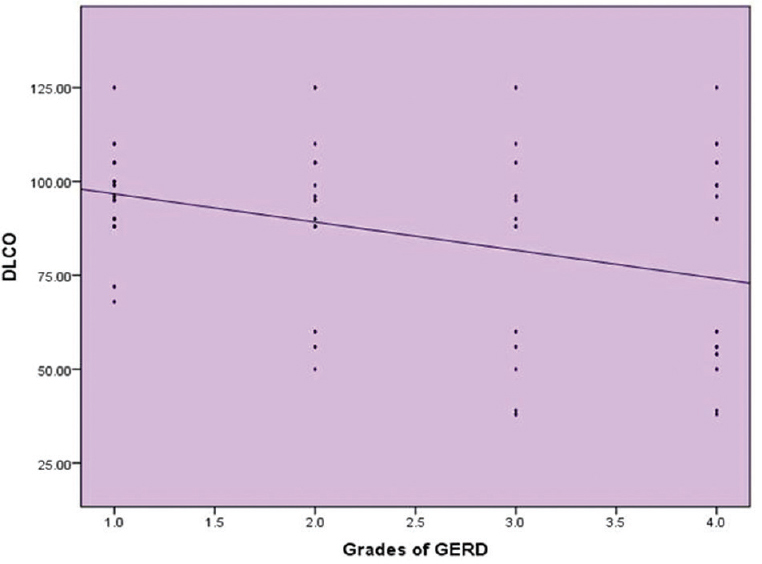 Figure 2: Correlation between grades of GERD and DLCO. DLCO, diffusing lung capacity of carbon monoxide; GERD, gastroesophageal reflux disease. When the grade of GERD increased, the degree of ILD patterns on chest HRCT increased. All patients with GERD grades A and B had normal chest HRCT. Eleven patients with GERD grade C had ILD pattern on chest HRCT: five patients had a ground-glass appearance and six patients had a reticulonodular pattern. Fourteen patients with GERD grade D had ILD patterns on chest HRCT: four patients had a ground-glass pattern, nine patients had a reticulonodular pattern, and one patient had a honeycomb pattern [Table 3]. There was a statistically significant positive correlation between chest HRCT and grades of GERD [Figure 3]. 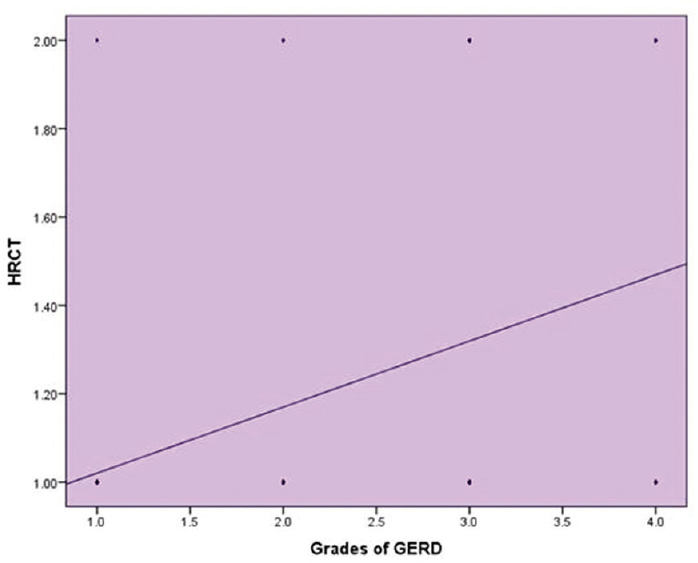 Figure 3: Correlation between grades of GERD and HRCT finding. GERD, gastroesophageal reflux disease; HRCT, high-resolution computed tomography. 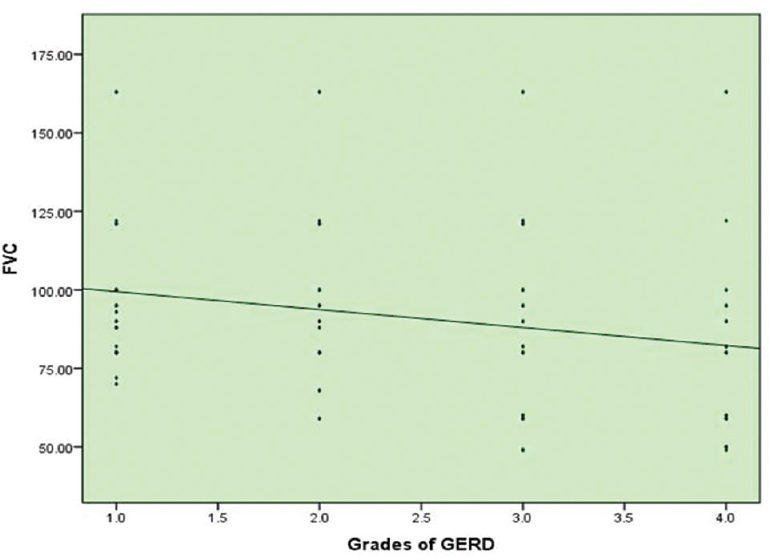 There was a statistically significant negative correlation between grades of GERD and FVC% [Figure 4]. ILD is a chronic and ultimately fatal disease characterized by a progressive decline in lung function. The term pulmonary fibrosis means scarring of lung tissue and is the cause of worsening dyspnea (shortness of breath). Fibrosis is usually associated with a poor prognosis. The cause of the initiating alveolar epithelial injury is unknown, but postulated mechanisms include immunological, microbial, or chemical injury, including aspirated gastric refluxate . In susceptible individuals, repeated microaspiration of gastric refluxate may contribute to the pathogenesis of ILDs . The present study was carried out in the Chest Department, Menoufia University Hospital, on 100 patients [61 men (61%) and 39 women (39%)]; their ages ranged from 25 to 65 years, with a mean age of 48.6 ± 8.18 years. They had been diagnosed with GERD according to Los Angeles classification (grades A, B, C, and D) . They were selected from the Tropical Medicine Department, Menoufia University Hospital, and did not have a history of chest troubles. The ages of the patients were significantly high in those with severely decreased DLCO. Moderately and severely decreased DLCO was significantly higher in men than in women. These results are in agreement with those of Gribbin et al. , who reported that ILDs were significantly higher in elderly patients. However, Everett et al. found that there was no relation between the age of patients and the development of ILDs in patients with GERD. In this study, when the severity of GERD increased the mean value of the percentage of DLCO decreased, as in patients with GERD grade A the DLCO mean was 95.9 ± 11.6, in patients with GERD grade B the DLCO mean was 91.8 ± 21.3, in patients with GERD grade C the DLCO mean was 78.6 ± 28.3, and in patients with GERD grade D the DLCO mean was 75.4 ± 26.8. These results agreed with those of Ali et al. , in whose study there were statistically significant differences between cases with different grades of reflux as regards DLCO. The grade of reflux was the only independent factor affecting DLCO, and grade B patients showed lower DLCO compared with grade A patients. In contrast, Miller et al. reported that there were no relations between grades of GERD and DLCO. These results could be explained by the variation of lung affection in patients with GERD and by different numbers of patients in each study. In this study, there was a statistically significant negative correlation between grades of GERD and DLCO among the studied patients. When the severity of GERD increased, the DLCO mean decreased. These results are in agreement with those of Elliot et al. , who reported that DLCO was correlated to grades of GERD. These results disagreed with those of Ali et al. , who reported that there was a negative correlation between grades of reflux and DLCO, but it was not significant. In this study, there was a highly statistically significant difference as regards grades of GERD in relation to chest HRCT. These results agreed with those of Bandeira et al. , who reported that 60% of the studied patients with GERD grades A and B had normal chest HRCT and 40% of the studied patients with GERD grade C had ILDs patterns on chest HRCT. In contrast, these results disagreed with those of Sweet et al. , who reported that there was no relation between grades of GERD and ILD patterns on chest HRCT. These results could be explained by the variation in lung affection in patients with GERD and the variation in the grades of GERD. In this study there was a statistically significant positive correlation between chest HRCT results and grades of GERD. When the grade of GERD increased the degree of ILD patterns on chest HRCT increased. These results are in agreement with those of Salvioli et al. , who reported that there was a positive correlation between grades of GERD and chest HRCT. However, these results disagreed with those of Hunninghake et al. , who reported that open lung biopsy was the only method for diagnosing ILDs in patients with GERD and that there was no correlation between grades of GERD and chest HRCT. In the current study, there was a statistically significant negative correlation between FVC% and grades of GERD. It was clear from this study that there was a highly significant reduction in the percentage of predicted FVC in patients with ILDs when the grade of GERD increased. These results are in agreement with those of Ali et al. , who reported that there was a statistically significant positive correlation between grades of reflux and FVC, FEV1/FVC, forced expiratory flow 25–75%, and maximum midexpiratory flow/peak expiratory flow. On the other hand, the results of Troshinsky et al. are not in agreement with this study as they reported that there was no statistically significant correlation between grades of GERD and pulmonary function tests. The present data support and extend the theory of a high incidence of pulmonary involvement in GERD patients, even in those patients free of respiratory symptoms. Pulmonary function testing including DLCO has been a cornerstone of pulmonary medicine for over a century, being simple, safe, and noninvasive; thus, it can aid in the diagnosis of pulmonary involvement. Overall, pulmonary function tests, including DLCO, are more sensitive in detecting pulmonary involvement in GERD patients than is chest HRCT. Eldahdouh S, EL-Mahallawy II, Elaaty HS, El-Lehleh AM, Mohammed LI. The accuracy of the clinical diagnosis of new-onset idiopathic pulmonary fibrosis and other interstitial lung disease: a prospective study. Chest 2008; 116:1168–1174. Crystal RG, Ferrans VG, Basset F. Biologic basis of pulmonary fibrosis. In: Crystal RG, West JB, editors. The lung scientific foundations. New York, NY: Raven Press; 2009: 2031–2046. Simpson WG Gastroesophageal reflux and asthma: diagnosis and management. Arch Intern Med 2010; 155:798–803. Yang SY, Lee OY, Bak YT, Jun DW, Lee SP, Lee SH, et al. An evidence-based appraisal of reflux disease management – The Genval Workshop Report. Gut 2008; 44(Suppl 2): S1–S16. Gribbin J, Hubbard R, Smith C Role of diabetes mellitus and gastro-oesophageal reflux in the aetiology of idiopathic pulmonary fibrosis. Respir Med 2009; 103:927–931. Bandeira CD, Rubin AS, Cardoso PF, Moreira JD, Machado MD. Prevalence of gastroesophageal reflux disease in patients with idiopathic pulmonary fibrosis. J Bras Pneumol 2009; 35:1182–1189. Everett C, Morice A. Clinical history in gastroesophageal cough. Respir Med 2007; 101:345–348. Ali ER, Abdelhamid HM, Shalaby H. Effect of gastroesophageal reflux disease on spirometry, lung diffusion and impulse oscillometry. Egypt J Bronchol 2016; 10:189–196. Miller MR, Hankinson JA, Brusasco V, Burgos F, Casaburi R, Coates A, et al. Standardisation of spirometry. Eur Respir J 2005; 26:319–338. Elliot TL, Lynch DA, Newell Jr JD, Cool C, Tuder R, Markopoulou K, et al. High-resolution computed tomography features of nonspecific interstitial pneumonia and usual interstitial pneumonia. J Comput Assist Tomogr 2005; 29:339–345. Sweet MP, Patti MG, Leard LE, Golden JA, Hays SR, Hoopes C, Theodore PR. Gastroesophageal reflux in patients with idiopathic pulmonary fibrosis referred for lung transplantation. J Thorac Cardiovasc Surg 2007; 133:1078–1084. Salvioli B, Belmonte G, Stanghellini V, Baldi E, Fasano L, Pacilli AM, et al. Gastro-oesophageal reflux and interstitial lung disease. Dig Liver Dis 2006; 38:879–884. Hunninghake GW, Lynch DA, Galvin JR, Gross BH, Mu N, Schwartz DA, et al. Radiologic findings are strongly associated with a pathologic diagnosis of usual interstitial pneumonia. Chest 2003; 124:1215–1223. Troshinsky MB, Kane GC, Varga J, Cater JR, Fish JE, Jimenez SA, Castell DO. Pulmonary function and gastroesophageal reflux in systemic sclerosis. Ann Intern Med 2000; 121:6–10.